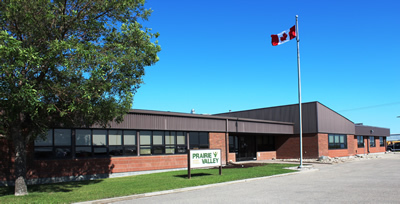 Prairie Valley School Division staff were honoured to have Cpl. James Sinclair speak about his experiences as a peace keeper and in active duty with the Canadian Armed Forces. Cpl. Sinclair shared video footage and anecdotes of his time in service. His presentation was moving and humbling, made even more so by his earnest gratitude to the room – thanking Prairie Valley staff for the work they do and celebrating the importance of education. The ceremony also featured a vignette about decorated Canadian Pilot Officer Andrew Mynarski, a recording of the Last Post and a moment of silence. “Cpl. Sinclair reminded those in the room that while educating may be our profession, humanity is our career” said Director of Education/CEO, Ben Grebinski.